Gentry Stein introduces himself and explains the goals of this video series, which includes teaching about yoyo contest rules, details on how to create yoyo tricks that score, how to construct a competition freestyle with purpose, routine practice techniques, as well as how to approach sponsorships. How to Become a Yoyo Champion: Vol.1 Introduction Yoyo TrickThis video is an introduction to the “How to become a Yoyo Champion” video series. 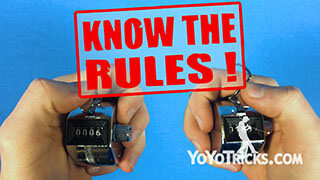 In this series we’ll cover everything you need to know to put yourself on the right path to becoming a yoyo champion. We’ll be going into detail about contest rules, how to create tricks that score, routine construction, practice techniques, and even how to get sponsored. 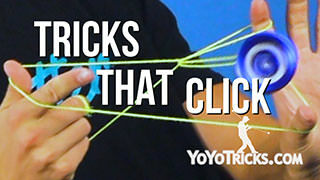 I’m super excited to be teaming up with YoYoTricks.com to teach you how to become a Yoyo Champion. For those of you who don’t know me, I’m Gentry Stein. I have been competing in yoyo contests since 2009, and have competed as a Yoyofactory sponsored player since 2010. In 2013, I won my first of three US National Titles, and in 2014 I Won the World Yoyo Contest in the 1a Division. Over the years I’ve designed multiple Signature yoyos with Yoyofactory. I currently compete with the Shutter and Replay Pro, and have major titles with each. Certainly there are a lot of excellent players out there, some of whom have even better records than me on the competitive stage, and YoYoTricks.com could have asked any of them to come and help them make this series. So why me? When the guys at YoTricks asked me to put together this series, they let me know it was not just because of the contests I have won, but because they felt I had a very balanced approach to competition, and I agreed. When I compete I try not to rely on just one aspect of yoyo play like making every single trick super fast, or brutally difficult to give me an edge over the competition. While both speed and difficulty of tricks play a significant parts in my routines, I also do what I can to score as high as possible in every category that is judged at a yoyo contest. This not only helps my tricks stand out whenever I compete, but also brings more focus to the performance aspects of yoyo competition – something a lot of players have a tendency to ignore when building their routines. When I create a new routine I consider every trick, every movement of my body, and every music cue from the perspective of how it will contribute to the various categories that are judged in a yoyo contest. 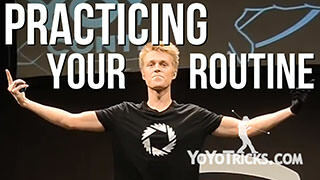 This approach has not only helped me succeed as a competitor, but is has also given me a great deal of insight into how to prepare winning routines, and into how yoyo contests are scored. In this series I am excited to share those insights with you. To introduce this series, let me give you a little backstory on myself. I had about three years of practice until I competed in my first contest. During those first three years, I was lucky enough to be mentored by some of the most established yoyo players in the world including Thad Winzenz and Hironori Mii, two of the founders of the current yoyo judging system and organizers of some of the largest contests in the world, along with the 2004 US National Champion Augie Fash. While the competitive yoyo scene can be pretty intimidating at first, having these guys help me get started made all the difference. That is part of the reason I am so excited to make this series, so that you too can feel like you have someone with a lot of experience in your corner keeping you on the right track. My first contest was the 2009 Bay Area Classic Regional. While it took me three years to get on stage and compete for the first time, I would definitely recommend getting on stage and competing in a contest as soon as you can, because there is no good reason to wait. In my opinion, the BEST time to start competing is when you feel like you aren’t quite ready yet. The experience of getting on stage for the first time and performing at a legitimate contest – even before you feel ready – is useful because there is no other way to practice getting over stage nerves. Nearly every player deals with the fear, the sweaty shaky hands, and the difficulty of landing tricks in front of people. The only way to overcome this is to practice doing it, and if you wait to get started competing you are missing a golden opportunity to learn to perform under pressure. So even if you don’t have a contest coming up in the near future, if there’s a talent show or even something small like a family barbecue, take the opportunity to practice your routine in front of a live audience. It will definitely help. At my first contest, I ended up placing 15th in the Finals. Keep in mind, contests in 2009 weren’t nearly as competitive as they are now. I was not satisfied with my performance. I was super nervous, I missed a bunch of my tricks, and I realised that nailing a routine in front of a judging panel and a big audience was definitely not an easy thing to do. However, every time I competed in another contest, I gained a higher level of confidence. Two years later In 2011, I won my first contest, the Pacific Northwest Regional in Seattle. After another two years of practice, in 2013, I went into the world contest confident that I would take the win, but I actually ended up not even making finals. I realised I needed to broaden my approach to competing in order to start winning bigger contests. I started talking to judges, and realised I wasn’t competing according to the rules. I needed to start constructing my tricks in a different way, as well as structuring the routine with greater purpose. A few months later, Yoyofactory and I released my signature model yoyo Shutter, and I won US nationals with it. After that, I saw it would take a lot more work to win the world title, so I immediately got to work preparing 10 months before worlds 2014. A month before worlds that year, I flew to Japan to train for the event. Some days, I practiced for over 8 hours a day. I entered the contest more prepared than ever. Everything felt right from the moment I walked off the plane in Prague to accepting the trophy for 1st place at the event. The things I learned during this time are what this series is all about. It’s clear to me that the help I received from key people when I was getting started was crucial. In addition, the experience I gained on the stage was just as critical as learning tricks off the stage. Finally, every time I was not as successful as I hoped, I did whatever I could to learn from those mistakes and improve my next routine. 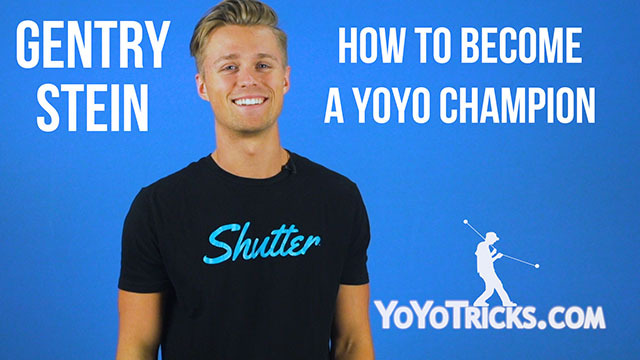 In this series my hope is to help you along your journey, just like others helped me, so you too can become a yoyo champion.